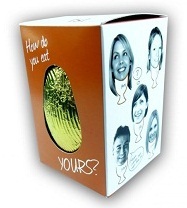 Have fun with the personalisation opportunities with our Small Easter Eggs with Logo Branding. With your company branding and logo on box, you can really get your message across to the customers - and why not utilise all six sides of the box with your custom artwork? Great as a business gift or company freebie, why not hand these Small Easter Eggs with Logo Branding and keep your brand name at the tip of your customer's tongue this Easter? For a FREE QUOTE, please fill in the form regarding our Small Easter Eggs with Logo Branding and we'll be able to help you.